Tourweaver allows you to fully control over every details on how the virtual tour appears,as well as as well as easily transfer interfaces and share them, etc. For Tourweaver 1.30, you can follow the below steps to make a skin. Go to File->Export Skin to name and save your skin as .sk file. For Tourweaver 2.00 and 3.00, please take following instructions. The images above can be *.jpg, *.bmp, *.gif, and *.png. The whole skin size will affect the tour loading speed, so please keep it as small as possible. Open Tourweaver and create a virtual tour project with blank template. Click the blank area in the Main window and go to Properties & Actions. Click the file button to add the background image to the main window. Select components in Toolbox to add to the skin. In this example, buttons are added to the skin. Just click button in the toolbox and click on the background image. Then in Properties & Actions panel, select Image and open the button images of above. Two images are perpared for one 'action'(left, right, up, down and etc. ), and you can choose to design three images for one action, so the button will have three status: normal, mouse over and mouse down status. 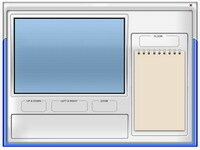 Click Actions tab in Properties & Actions panel and choose one action and double click to add the action to the button. The same steps are taken when adding Image, Thumbnail and all other components on the skin. Please note that ComboBox, ListBox, TextArea and Thumbnail have list values, you can click button in the Properties & Actions panel to set the content to show. Please do not forget to add a SceneViewer (must), or MapViewer(optional) to the skin. All the components have properties values that can be adjusted and some of them can have actions. For example, a company logo can be added to the skin as an Image component and we can set its action as Misc->Link URL->http://www.easypano.com. Now the skin is completed and please click File->Export Skin to save the skin for future use. You can view this skin sample Here. For Tourweaver, refer to this video tutorial for creating virtual tour skins. How can I multi-select more than one elements, and delete or move them together? How to convert other sound files to .au format for Tourweaver 1.30?